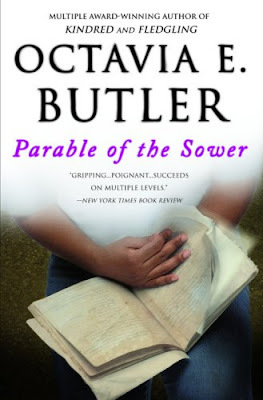 First, what I really enjoyed about The Parable of the Sower. The future world that Butler has created, although extreme and shocking at times, is very believable and detailed in its portrayal. She really takes the time to flesh the world out - the people, their situations, the way that they live their lives, and the reasons people act the way that they do - throughout the book's 300 plus pages. By describing the setting through the eyes and mind of a girl struggling to deal with and understand it, you really feel like you have an insider's view of the world - and like you're really there. This first-person form of storytelling, combined with a second-half journey outside of the protection of a walled community and into that tragic world itself, creates an incredibly involving story. Although the first half of the book felt extremely slow and lacking in connection between the reader and the story, once the main character's journey across California gets started, you really feel like you're there walking with her rag tag group, with them every step of the way. This half of the novel is bleeding with tension and entirely gripping - and kept me turning the pages, wondering what they would encounter next. Two things about Butler's novel, for me, could have been a lot better. The first I've already touched upon: the first half of the novel is dreary. Other than the main character, none of the personas and relationships that are built in the first half survive or continue into the second half. Yes - this is because the main character loses a lot of her family and friends, but it also means that the reader doesn't feel a connection with anyone for 150 pages. And although many tension-building incidents happen while she's living inside the community, you never truly feel like she's in danger. Secondly, the book is a bit preachy. Since most of it is about how the main character finds a new religion called Earthseed, much of it is spread throughout the book, and it doesn't make the novel any more interesting or engaging. - Takes much too long to get going - I was losing patience after 150 pages!